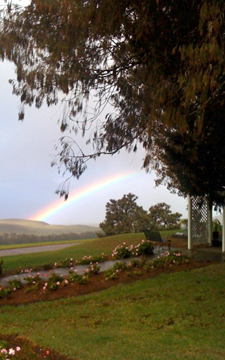 In the last chapter, Rebekah, DH, cousin Nathan, and cousin Ann left North Kohala without seeing Grandfather Chong’s house. It was no longer on the former Bond Estate land in Ainakea! A neighbor said the house was hauled away on a truck. Where, oh, where was it now? 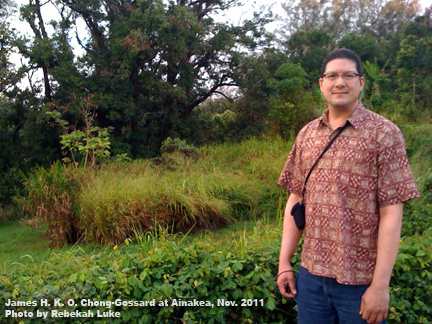 Back on Oahu in June 2011 I searched the internet for the folks who lived in the house once, when it was the Kohala Family Homeschooling Learning Center run by Kether — names I didn’t recall until I saw them on the web. Kether confirmed the house and the one next to it were hauled away on a truck. In fact, she would give me the name and number of the man who took them. Thomas A. Quinlan. Mr. Quinlan rescues historical buildings, finds other land for them, and restores them. It’s his passion. 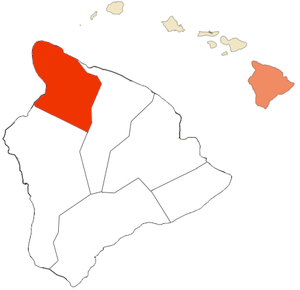 North Kohala highlighted on a map of Hawaii island. He said one of the houses was in Waimea (about 40 minutes drive away) with a veterinarian, and the other was behind Kita Store, the little green one right on the highway on the way out of Hawi going toward Kona ( about 5 minutes away). A new family was ready to move in. While on the telephone I’d written in my notes where “our” house was and where the “bachelors'” house was. My grandmother cooked for the bachelors next door during her time at Ainakea. After we hung up, I looked at my notes, but I didn’t trust them. My slight dyslexia sometimes causes me to reverse elements of pairs if the information comes in too fast. Which house was where? Shucks. It’s a long time before our August 2012 reunion that we’re planning for Kohala (hence the house search); I’ll verify the site later, I thought. Jim’s aunt, who is my first cousin Elly, arranged for us to stay overnight in a private guest cottage at Kahua Ranch up in the mountains. It would be all right, as she would be there too. I emailed Tom Quinlan to ask about the houses again. As Jim and I left for Kohala, no reply. Last Tuesday afternoon we drove down to Hawi looking for Kita Store. There were several painted green on that main street, and none named Kita. The realty office that helped me on the last trip was open, so in we marched to ask. 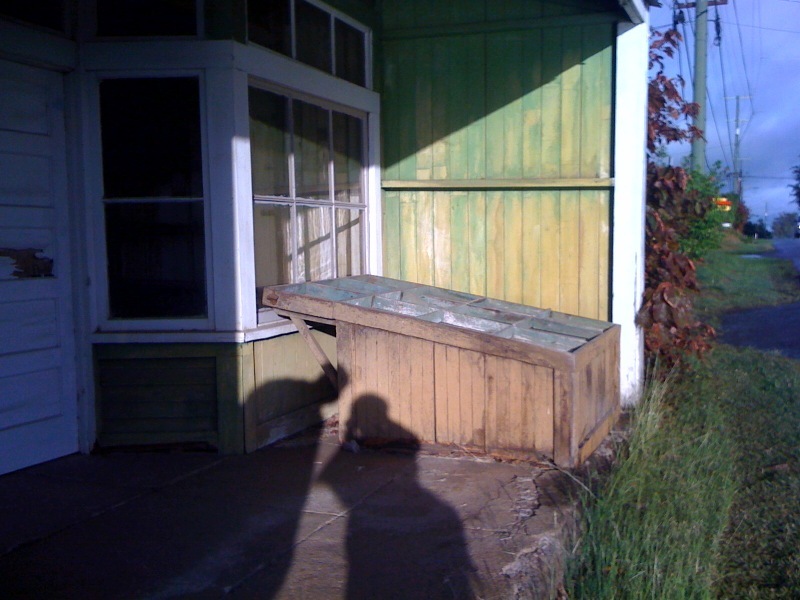 Afternoon sun casts our shadows across the Kita Store storefront, with abandoned produce bins. Through the window we saw shelves and fixtures as in a dry goods store. We learned that Kita Store was closed, in cobwebs, and a little farther down the highway pass the theater. The kind woman in the office provided us with a detailed description, and pinpointed the property for us on a map. 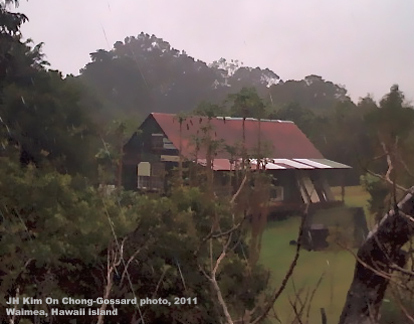 The house we found in Hawi didn’t look right to me. Nope. I don’t think so. I think this was the bachelor’s house, I said to Jim. No one was home. It began to rain, and we quickly took the opportunity to take some snapshots of the exterior. In the morning we would call the vet in Waimea. We then went to Ainakea so Jim could see that, indeed, no house was there anymore. On the drive up the mountain back to the Ranch, I remembered my friend Phil was now working at a ranch in Kohala, but I wasn’t sure which ranch or if there was more than one ranch. At supper around the kitchen table in the main house I asked the owner Monty Richards if Phil worked there. Yep, he’s here, he works in the shop. Phillip Oveland is a professional motocross racer, the nephew of my good friend Andrea who lives across the stream from my studio. We’ve played poker together, but I don’t see him much since he moved to Hawaii island. I could pay him a visit in the morning. Late that evening I saw the email reply from Tom Quinlan. 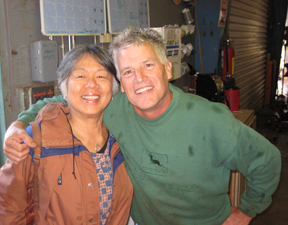 He was in Ireland restoring an old castle and would be back in Kohala next week. The house behind Kita Store needed to be moved again, he wrote, and he was looking for a suitable spot. Did I know of a place? His inference (by me) was that it was our ancestral family home. I still wasn’t convinced and again reviewed comparison photos. One clue was the roof. It was white while the roof of the one we were really searching for was red. After breakfast I phoned the vet’s office, and he was out of town until . . . next week! His staff knew of the house I asked about, and yes, I should wait until the doctor came back. I left my name and number. Guess I could ask for him to send a picture. Later. Jean told us where to go. We did. And, without a doubt, we found Grandfather Chong’s house sitting comfortably against a beautiful backdrop of the misty hills of Waimea, still under restoration and looking beautiful and well cared for. 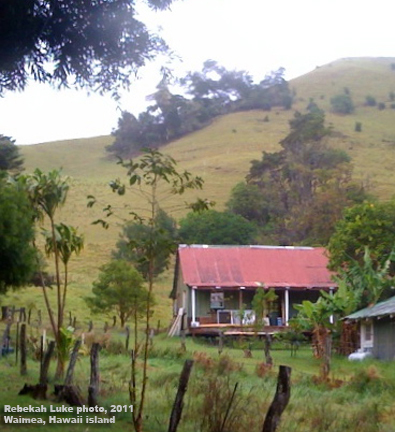 Our family's old house from Ainakea has new life in Waimea. We're thrilled!